It was 2005 when I first knew about Mario Maurer from a friend of mine who was able to watch his film "Love of Siam". I even remember visiting his thread in Pinoyexchange when I was still an active user that time. But it was only in "A Little Thing Called Love" that I really appreciate him as an actor. I loved the story (I always do when there are parts of a certain movie that I can relate to), and Mario and Baifern, the lead girl in the move, had this amazing chemistry. The Thai actor had visited our country for numerous times already. I was even able to see him in person last year, when he returned here for the promotion of his movie with Erich Gonzales, "Suddenly It's Magic". 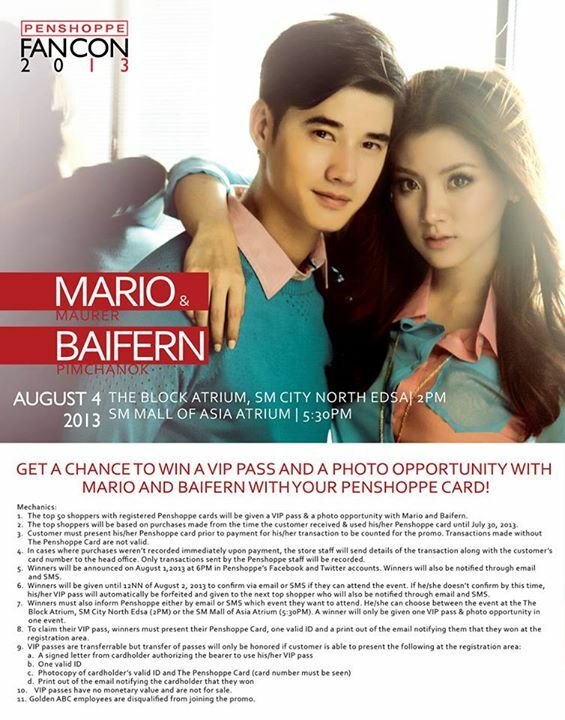 And for the nth time, Penshoppe is again giving his Pinoy fans (and even Baifern's fans as well) a chance to see this cute onscreen couple together in one event on August 4! I'm pretty sure the fans of their successful movie will line up for this event. Below are the mechanics for the Meet and Greet, which is also found here. I won't be in Manila that day so I'll just check updates online about this event. And if you get to attend this, please do share your experience. I'd be happy to know things about the Meet and Greet. Have a nice day!